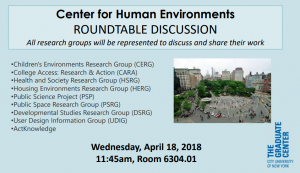 Environmental Psychology at The Graduate Center » CHE Brown Bag April 18th! CHE Brown Bag April 18th! Come check out the Center for Human Environments‘ Round Table Discussion on April 18th at 11:45 in Room 6304.01 (The Hub)! All Brown Bag Events are free and open to the public!